We had the opportunity to review a physical copy of the book Forensic Faith for Kids and the Case Makers Academy website from David C Cook. Standing strong in your faith and having the confidence to share it can be difficult if you do not have a strong foothold and the knowledge. Certainly, you can memorize what you hear during Sunday morning service or at weekly night Bible study, but do you really know what you believe? Can you defend your faith with evidence? 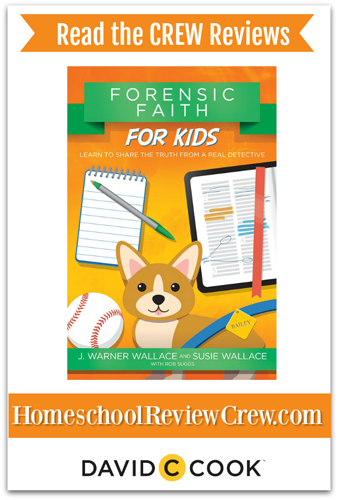 Authors and husband and wife team, J. Warner Wallace and Susie Wallace, have collaborated on Forensic Faith for Kids. The book is geared towards children, eight to 12 years old (third to fourth grades). The Wallaces present children with the challenge of not just learning about their faith, but to “investigate Christianity like a detective”. Discovering evidence that will help them strengthen their faith as well as be able to share it with others and provide evidence if needed. One thing we all know for sure is that God is real? Many people accept that fact without any question. What if you had to defend that fact and others regarding Christianity? Would you be able to do it? The Wallaces show young readers how to defend their faith with evidence they discover just like a detective would do. J. Warner Wallace happens to know a little bit about detective work having built a career as a “cold case” detective. Readers learn how to “investigate and share the truth”, because as Christians we are to share the truth about God with others. Because most unbelievers walk by sight and not by faith, we need to be ready with evidence when we share God with people. Forensic Faith for Kids teach children the investigative tools to find (and learn) the evidence they need. Hopefully, they will grow up and become adults who know how to share and/or defend their faith. Forensic Faith for Kids opens with an introduction to the Junior Detective Cadets – Daniel and Jason, and eventually Hannah. Already, they have a mystery on their hands. It is not a disappearance, but an appearance of a cute Corgi named Bailey. With the help of Detective Jeffries, the cadets begin their investigation to find Bailey’s owner. The investigation continues through a story format with an engaging story. Each chapter includes Detective Definitions with words that define different aspects of an investigation. Some words like evidence, deploy, interviews and training are defined and are ones readers can use in their own investigation of finding evidence to defend their faith. Some other detective training exercises in the chapters include CSI Assignments that have references to Bible verses, which will equip them with more evidence for the case. The Detective Bags at the end of each chapter are wonderful encouragements. An example is at the end of chapter three, Time to Train!, readers are reminded to not be afraid when their faith is challenged. Instances like that should make them want to “pursue the investigation” further with the goal of acquiring more evidence. The Wallaces move the story online to the Case Makers Academy where the learning (and fun) continues, The website is a wonderful compliment to the Forensic Faith for Kids. There are several prompts, Dig Deeper, throughout the book telling readers to visit the website. Once there, readers find a variety of activity sheets, printouts and videos they may use to follow as they read through the book. By the time they read through the book, children will have a notebook full of activity pages (evidence) to make their case for Christianity. Students are able to earn a certificate of completion for “attending” Case Makers Academy. Access to the Case Makers Academy website is free. I really like how Mr. Wallace has applied the skills he learned as an investigator and is teaching children (and adults) how to be case makers for Christianity. Everything points back to God. 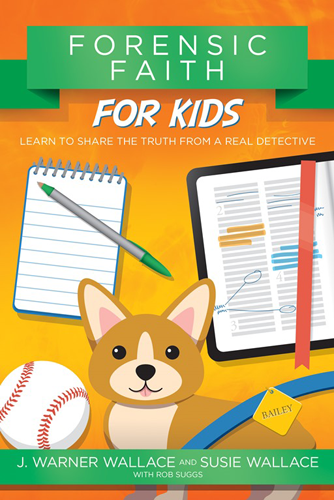 Forensic Faith for Kids will help children make the connection for themselves with the evidence they gather, so they can defend when challenged, and share their faith with others. Forensic Faith for Kids as a paperback is available for about $10 and access to the Case Makers Academy is free.